The District Industries Centre under the Gorkhaland Territorial Administration today felicitated several artisans at the District Level Handicrafts Fair 2016 in recognition of their efforts at preserving indigenous forms of art and craft in Darjeeling district. Nine elderly artisans were presented with artisan pensions worth Rs 1,000 by Darjeeling municipality chairman Amar Rai, the chief guest. According to L.P. Bhatia, general manager of the DTA, many aged artisans are benefiting from the pension scheme but only those residing in Darjeeling town could make it to the ceremony today. Artisans and organisations who have done remarkable work in their respective fields were also honoured and presented with certificates and mementos. The DTA organises a district level handicraft competition every year, and this year’s winners were awarded today. The four winners received prize money of Rs 1,500 each, while the first and second runners-up were awarded with Rs1,000 and Rs500 respectively. The 10-day District Level Handicrafts Fair 2016, which is being held at Capital Hall, will continue till June 10. 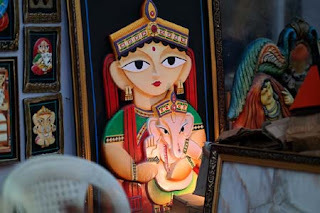 Handicrafts from Darjeeling, Kurseong, Mirik, Kalimpong and Siliguri are on display for sale. Bhatia said the fair has garnered almost Rs3 lakh in sales and many artisans have also received fresh orders. The District Industries Centre under the Gorkhaland Territorial Administration today felicitated several artisans at the District Level Handicrafts Fair 2016 in recognition of their efforts at preserving indigenous forms of art and craft in Darjeeling district.